Manufactured in Etats-Unis from 1914 until 0. Photography is sufficiently speaking about the size about this camera to avoid long explanations. It is about format 122 known as “postcard”. This camera is the autographic version of 3A. It acts of a folding camera with vertical off-centering. It is provided with a double release: flexible or pneumatic.On the left, one can see a tiny crutch which makes it possible to pose it in order to make horizontal photographs (true postcard). 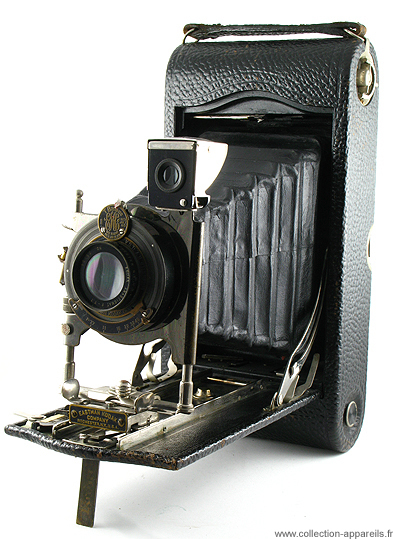 The loading is done by withdrawing the back completely, while pressing simultaneously on the two metal parts located at the back of each side of the camera. Is visible on photography, with middle height of the back. The Ball bearing shutter allows the time exposure (T or B), the 1/25, the 1/50 and the 1/100 of second. The aperture goes from 7,7 to 45. This camera is manufactured with wood, covered with leather with coarse grain. The back and the flap are out of covered metal. The job number of this camera is hidden behind the main crutch. This one is the 401.128.